A key part of any modern navy is its rotary-wing component. The capabilities that helicopters bring to naval operations are essential in the context of modern warfare, and many large navies around the world boast impressive fleets of shipborne rotary-wing aircraft. 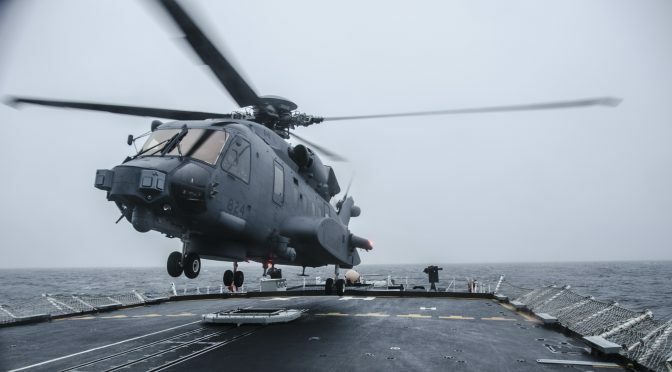 Smaller navies, however, need to make due with much less, and there is perhaps no better example of a small navy employing its limited rotary-wing assets to the fullest extent as the Royal Canadian Navy (RCN). 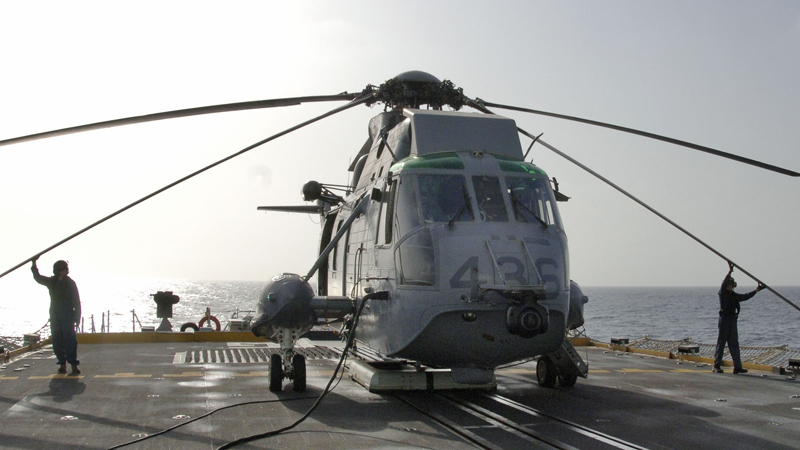 Serving with the RCN for over 50 years, the Sikorsky CH-124 Sea King has been the backbone of the navy’s deck based rotary-wing aviation. Based on the American-designed Sikorsky SH-3, the CH-124 was introduced in 1963 to augment the anti-submarine warfare (ASW) abilities of RCN vessels in response to the growing threat of increasingly capable Soviet nuclear submarines. Since then, the aircraft has proven its versatility by filling capability gaps in the sometimes cash-strapped Royal Canadian Navy by conducting search and rescue operations, disaster relief missions, and even patrols to monitor water pollution. Given the smaller size of Canadian naval vassals, the RCN found the Sea King’s fold-up rotor and tail to be particularly useful as this allowed the aircraft to be carried on the Iroquois-class destroyers and Halifax-class frigates. Likewise, the aircraft’s amphibious hull proved to be popular among its pilots, as it enabled the aircraft to conduct emergency “waterbird landings” if the need arises. Overall the Sea King became a jack-of-all-trades for the RCN, with the aircraft being one of the busiest in the whole of the Canadian Forces. Landing the Sea King on the deck of a small vessel in rough seas, however, still proved to be a significant challenge for the RCN. Nonetheless, an ingenious solution was devised in the early 1960’s by Canadian pilots of Experimental Squadron 10 (VX 10) based in Shearwater, Nova Scotia, with assistance from Fairey Aviation. What they developed was the world’s first Helicopter Hauldown and Rapid Securing Device (HHRSD), sometimes referred to as “beartrap.” To employ the retrieval device, a probe-tipped cable is lowered from the Sea King to the deck of the vessel upon which the aircraft is attempting to land. The ship’s crew then attaches the probe to a heavier cable and runs the assembly through the HHRSD. The cable is then winched back up and attached to the helicopter. Once secure, the pilot increases power and the cable synchronizes the helicopter’s movements with those of the ship. The pilot gradually decreases power and the frame of the beartrap steadily ‘reels in’ the helicopter until it touches down safely on the deck. In essence, the beartrap has allowed the RCN to conduct flight operations under even the most hostile weather conditions, and Sea Kings gained a respected reputation for continuing to fly during exercises and on joint-operations even when other NATO allies had suspended flight operations. To this day the beartrap stands as a significant Canadian contribution to deck-based rotary-wing operations, and the device was subsequently adopted by various navies around the world. By 1986, the Canadian Department of National Defence (DND) began to seek a replacement for the now aging Sea Kings. Problems with the aircraft’s transmission raised concerns about its safety and continued viability among DND staff in Ottawa. Nevertheless, the aging Sea Kings remained in service and were even pressed into action in the Persian Gulf in 1990. Shortly after this successful deployment, the Canadian Progressive Conservative government led by Prime Minister Brian Mulroney signed a $4.4-billion-dollar contract with European Helicopter to replace the aging Sea Kings with a version of the AgustaWestland AW101 to be designated the CH-149 Cormorant in Canadian service. However, a year later, the newly elected Liberal government led by Jean Chretien cancelled the order and only a few Cormorants were accepted into service. It would be another ten years before the Liberal government would sign a contract procuring a new helicopter for deck-based operations. Following a competition to find a suitable replacement for the Sea King held by the DND in 2004, the Sikorsky H-92 Superhawk emerged victorious. Shortly thereafter, the Canadian Government announced plans to acquire 28 new Superhawks under the designation CH-148 Cyclone. The price tag of the deal was a whopping $1.8 billion, a very significant sum for a Canadian defence expenditure. Deliveries were scheduled to start in 2009, but repeated delays due to development problems with the aircraft pushed the initial delivery of six helicopters back to June 2015. These delays caused significant political fallout as a number of government ministers publically criticized the program because of the setbacks. Nevertheless, the Canadian Government announced it was moving forward with the deal. Currently, a total of nine Cyclones have been delivered, finally allowing for the gradual retirement of the long-serving Sea Kings. Although it lacks the amphibious capability of the Sea King, the Cyclone’s performance characteristics are vastly superior, and the new aircraft will greatly enhance the rotary-wing capabilities of RCN vessels. In addition to the latest avionics, the Cyclone is equipped with Integrated Mission and Sonobuoy Acoustic Processing Systems developed by General Dynamics Canada. Furthermore, the helicopter’s armament consists of two Mark-46 Mod V torpedoes mounted on BRU–14 electro-mechanical ejector racks and door-mounted machine guns. The Cyclone’s airframe also incorporates protection from both lightning strikes and high-intensity radio frequency pulses. These characteristics make the CH-148 a very capable machine comparable to other modern deck-based rotorcrafts, such as the Eurocopter Panther and the NHIndustries NH90 NFH. 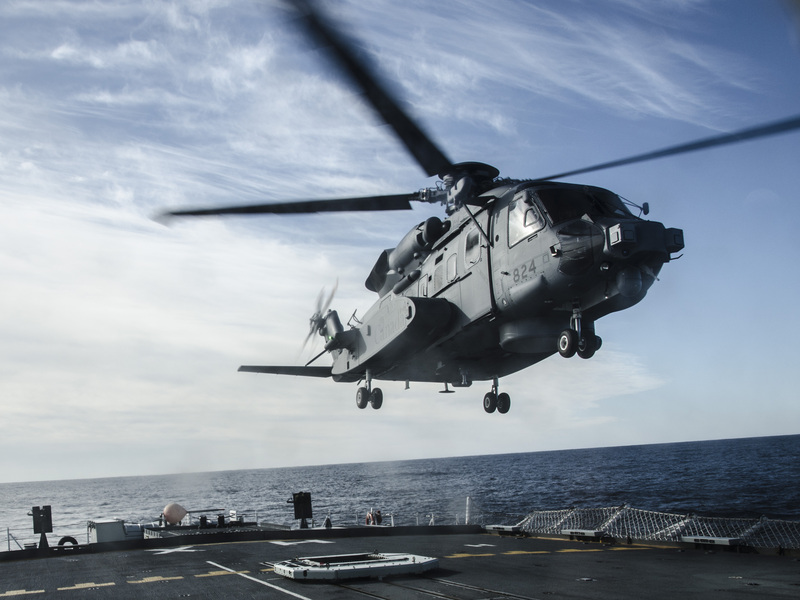 In the future, rotary-wing aircraft stationed on Canadian vessels will face a variety of challenges. Chief among these is the evolving threat posed by increasingly sophisticated Chinese submarines. Therefore, the ASW capabilities of the Cyclone could ultimately prove indispensable to the RCN in future operations, especially in contested waters or in Canada’s vulnerable Pacific littoral areas. Similarly, as Canada pivots to take a more active role in the Arctic, the Cyclone will play a key role in that theater of operations as a countermeasure to the potential threat posed by surface or undersea incursions. In addition, the RCN is also increasingly called upon to assist in disaster relief operations where reliable helicopters often prove to be highly valuable. The Cyclone will certainly be called upon for search and rescue, as well as tactical transport. Perhaps the greatest test the new helicopter will face will be to operate effectively in a low budget environment.Nevertheless, the Cyclone’s introduction into service signals a new era of enhanced safety and capabilities for rotary-wing operations in the Royal Canadian Navy, and the new aircraft will undoubtedly form the mainstay of this vital component for many years to come. Your might want to do some research on the origins of Beartrap. Suggest you talk to Cdr [ret’d] John Frank.